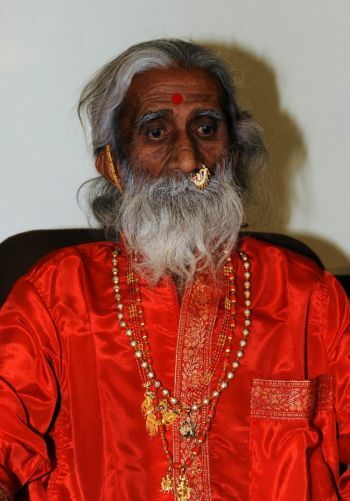 The recent study of Prahlad Jani – an 82 year old breatharian yogi living in northern India – has concluded after 15 days of observation by India’s Defense Institute of Physiology and Allied Sciences. Medical doctors and scientists have proven that during his observation, Prahlad Jani did not eat, drink, urinate or defecate. This is medically unprecedented. Doctors have not found any adverse effects in his body from hunger or dehydration. They think that yoga exercises may have caused Jani’s body to undergo a biological transformation. The researchers said tests found that his brain is equivalent to that of a 25-year-old. SHOWING THE MIRACLE: Yogi Prahlad Jani takes part in a press conference at a hospital in Ahmedbad on May 6. In fact, according to the Daily Mail, the doctors said that after fasting for two weeks, Jani was healthier than the average 40-year-old. When a person fasts, there are usually changes in metabolism, but that was not observed in Jani. Scientists will continue to analyze the results from this study, and it may take two months for them to draw conclusions. This entry was posted on Friday, February 15th, 2019 at 11:06 pm	and is filed under Articles.